Happy REAL opening day, baseball fans and Metro Riders. 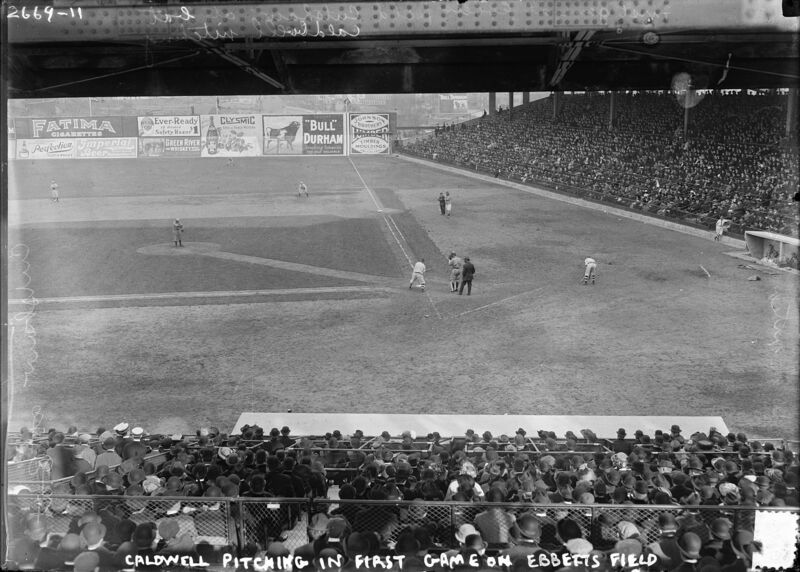 Above, the first game at Ebbets Field. Coverage of the four-hour hearing on Saturday over the proposed fare increase. As the story notes, most of the comments received were along the lines that the increases were too much. There was no support for the second option, which involves creating different fares for off-peak and peak hours. There was limited support for the first option, although some people said that transfers should be included for two hours, not 90 minutes as Metro proposes. Without an increase, Metro officials said they would have to cut one million hours of bus service and lay off 1,000 employees, according to the Times. Metro has not yet decided to put a measure on the ballot. But with as much as $27 billion in added tax money to spend on rail projects, advocates said, the agency could build a light-rail link to Burbank’s Bob Hope Airport, convert the San Fernando Valley Orange Line busway to rail and extend the Green Line near LAX to sweep through South Bay cities and connect with the Blue Line in Long Beach. “What we’re doing here is trying to figure out what wins,” Move L.A. Executive Director Denny Zane said. Guaranteeing projects across the county may be a political necessity, but it doesn’t always serve passengers the best, said Lisa Schweitzer, a USC professor who studies transit funding. She said transit-using communities with the potential for highest ridership, a common measure of success, tend to be clustered in the core of the county. Two things worthy of your consideration here: 1) the current Measure R put about $13.8 billion toward a dozen transit projects over its 30-year lifespan, and; 2) some of those projects — such as the Airport Metro Connector and the Sepulveda Pass Transit Corridor — may need more funds to get built. 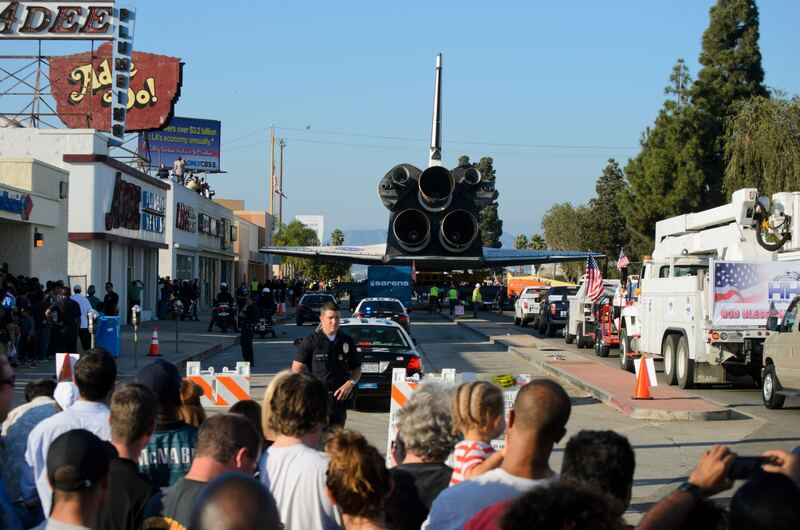 Crenshaw Boulevard is expected to lose about 175 trees to accommodate construction of the Crenshaw/LAX Line, leaving some residents unhappy in the wake of the 71 that were taken down to accommodate moving the Endeavour between LAX and the California Science Center in 2012. Metro has said it will plant two trees for every tree lost, although there is skepticism that new trees will truly replace the mature pines that are in Crenshaw Boulevard’s median, particularly in Park Mesa Heights. The Endeavour moving north through Park Mesa Heights in 2012. The light rail line will run along the median at right, where the trees are located. Photo by Steve Hymon. Subway construction won’t be accomplished without din, dust, vibration and street closures, Metro officials say, but 24-hour work will last for only a few weeks, said Dennis Mori, executive officer of project management. After an initial period of digging and pile installation, he said, tunneling itself will be less disruptive. Of course, there will be the nighttime rumble of trucks hauling away 1.1 million cubic yards of dirt. The city’s police chief says the problem is that Lyft’s drivers are not permitted as a taxi or limo drivers per municipal laws. Lyft says its drivers have insurance and go through background checks. A review of the controversy over widening Santa Monica Boulevard to accommodate bike lanes. The widening would cause some grass to be removed on the north side of the street. The post includes city diagrams to see what is being proposed. Lots of debate in the comments. The old bridge is being replaced. The city of L.A. intends to tear it down while some activists say the old bridge should host a park. My three cents: the most important project in that area needs to be getting the L.A. River bike path into downtown L.A. While I know MOST (not all) of the public comment at the fare hearing was very anti-increase, I wish that comments submitted via email and postal mail were able to be as visibly public. I don’t know if they would skew the same or not, but it would be interesting to see comments that are written instead of spoken and possibly less emotionally driven. Are all of the comments eventually put together into a public report like they are for EIRs? I think you raise an interesting point about the written public comments. Let me ask around here and get the agency’s response about whether those comments will be publicly released. The summary of all comments (written and provided at the public hearing) will be provided in our Board Report in May before the Board votes, as I believe it will go to Committee. So they will be compiled and released and I’ll be sure to post as soon as I get it. You might want to spell “Ebbets” right if you insist on including non-transit content. Thanks for the heads up! I will correct as I do insist that we include occasional non-transit content to complement the voluminous transit content posted to this site. If there’s something we’re not posting that you want posted, feel free to let us know. I agree that written comments should also be taken into consideration first than the public hearing this past Saturday. However, I think Metro has yet to receive all of the written comments yet, especially those who sent in comments by the old fashioned way via snail mail. The letters to Metro regarding fare increases must be postmarked by March 29, but since March 29 was a Saturday, some post offices were closed so there has to be also several letters that were dropped into the mailbox that might not get postmarked until the next business day, which is today, Monday March 31. If so, then some letters may not get delivered until tomorrow or Tuesday. Remember, many folks do not have access to computers. Many senior citizens still use the typewriter and send things out via postal mail. Although a fare increase is not desirable the public must realize that running one of the largest transit systems in the United States costs money. Every large city I’ve been to and used public transit had fares that usually are double what the MTA currenly charge. You want clean reliable buses and trains, they don’t come cheap. What the MTA needs to understand is that if it expects to be able to have UNRESTRICTED ACCESS TO federal, state, and local tax dollars for public transit, it should ACTUALLY SPEND MONEY ON THAT PUBLIC TRANSIT! This is not getting done, when MILLIONS are being wasted on things like: parking garages whose roofs collapse during construction (see Division 13 site at Cesar Chavez and Vignes! ), a “Master Plan” for a railroad station (Union Station!) that people move through, but does NOT move itself, and a “train depot restoration” (North Hollywood train depot), that serves… NOBODY! And the MTA has the audacity to “propose” a fare increase? They are not competently spending tax dollars on bus and rail operations as it is! Not to metion also, it is not until THIS YEAR (2014!) that all rail stations have had “gate-latching” occurring! Finally, there is the bus farebox recovery rate! I have ridden on more MTA buses in one day, where the fare boxes were NOT WORKING, then were (FREE RIDES FOR ALL ON RANDOM DAYS!). So, in what universe is it fiscally justified for the MTA to “propose” fare increases? I MIGHT be on the side of such, if all of the above were rectified, AND the MTA was AUDITED by the state’s “Joint Legislative Audit” committee (which is apparently the ONLY auditing body that has ANY fiscal oversight over the MTA!). THAT needs to happen YESTERDAY! Only after that, and all of the above are done, would I endorse a fare increase for bus and rail riders! HOW can the MTA “cut 1 million hours” of bus service, when: 1.) they probably do not run that much to begin with (given all the bus line cuts and eliminations they have done over the last 4-5 years! ), and 2.) assuming there IS “1 million hours” of bus line service, then eliminating these “1 million” hours, serves only to kill off 100% of ALL BUS LINES (not that the MTA has not tried hard at that already!). I have never seen a transit agency that is as ANTI-BUS RIDER as the L.A. County MTA is! There is NO EXCUSE for a fare increase, nor FURTHER bus line reductions or eliminations! If bus line eliminations continue, then the MTA may as well be abolished as well! There would be nothing left for it to be against at that point! Are any of your “large cities” that you’ve been to, any of them in Asia? Or are you selectively taking a look only at Europe and other cities in North America? Because if you are, then you are dead wrong that fares are “double the prices” than Los Angeles. If you go to Asia, fares are not that high despite their high farebox recovery ratios. Hong Kong manages to get a whopping 186% farebox recovery ratio from transit fares alone. Singapore manages to get a 126% farebox recovery ratio. All of these facts and figures, including their financial data are easily found on the web. The fare system in Asia is far different from what transit agencies in the US does. They make fares start off really cheap, like 60 cents or so, but the prices goes up the farther they travel. By doing so, they can capture the value of transit based on each individual’s travel distance needs. Providing public transit does not just involve buses and trains. Although the building failure for the future div. 13 is unfortunately there is a need for an additional operating division. In 2011 the MTA went from being a tenant at Union Station to being the landlord there. If my memory serves me right the land Gateway Plaza sits on was never owned by the MTA , the MTA having a long term lease of all the land including where the MTA Building stands. Having control of the train station provides the MTA the rights to improve transit at that location without the constraints it has faced previously. I believe the state or federal government has mandated the North Hollywood Train Station be restored, it’s a historic structure. Those at the MTA truly believed they could run a rail system with a honor system payment method. But remember, none of the upper personal at the MTA after the merger had transit operation experience. They terminated many executives from the former RTD who had all come up thru the ranks and knew transit operation. The LACTC was anti passenger service and at one time when a temporary sales tax with instituted cutting the fare from 85 cents to 50 cents they threatened the RTD with their loss of subsidy if they didn’t take the extra buses off the street put there due to a increase in ridership. Concerning broken farebox’s. They are supposed to be high tech and with the buses rolling down the street over poorly maintained roads they are jolted out order. Fareboxes are repaired at night. If the buses are pulled off the streets during the day that might be the bus your waiting for. 3.) Efficiency involving farebox working, and fare COLLECTION on MTA buses, and at light-rail stations! You would think that after 21 years of existence the MTA would have had THESE SIMPLE CONCEPTS, nailed! They do not! And you are making a 21 year old excuse for them? PATHETIC! Please tell me you do not work for the MTA! If you do not, I will forgive your ignorance! If you do, then it is YOU that is clearly part of the obscene, pathetic, overwhelming PROBLEM AND CULTURE, that makes the MTA what is, does, and is reflective of! MASSIVE CHANGES ARE NEEDED AT THIS AGENCY! NOW! “Non-Transit”? As I recall, fans of the team which played at Ebbets Field had to dodge trolleys to get to the games. So much that the name “Dodgers” stuck even after “Da Bums” moved to California. Soooo many whiners. If you can’t afford the bus and if you can’t buy a car, then buy a moped! If Metro can’t figure out a business model that it has to cut bus services, then don’t ride Metro, buy a moped! That’s what third world countries with people that live on less than a dollar a day uses as their main mode of transportation. I mean hello? Are you telling me that the people of LA who ride buses are poorer than third world countries? If monthly passes are going to cost $135 a month, it’s going to cost over $1600 a year so you might as well just buy a good moped instead. Then all your problems are solved. No more waiting for the bus, you can just hop on your moped and go anywhere you want. Moped get great gas mileage upwards of 100 MPG that you’re likely to be spending only $5.00 in gas a week anyway. because that’s what MPG means: you’re going to get 100 miles per a gallon of gas. And how much is a gallon of gas? About four bucks. Do you even travel 100 miles in a week? No. So you’re likely to get by with less than $5. That’s much more cheaper than the bus. I assume you’ve never been to Taiwan or any other city in Asia then because transit over there is not that expensive. Every transit system in Asia, fares are low and they all make profit without the need of any fare increase for a long time. “Fares going up all the time” just doesn’t happen in Asia. Because in Asia, transit is profitable, there’s no need to increase fares to cover losses. In Taipei, where I am originally from, fares are not that high. We never raised our fares in the past 15 years. And it always makes a profit. How do we do it? Because we understand the needs of the people. And we understand that people have different transit patterns from person to person. Therefore, we do a pricing model that is based on where you start off and where you get off and how far it is between the two places. When converted to US dollars, it starts off around 65 cents for the shortest trip and $1.81 for the longest trip. It sounds cheap right? But this is the price when you buy a single journey ticket at the machine. You get more discounts when you use the contactless card system. The discounted rate goes down to somewhere between 53 cents to $1.44. This way, it encourages people to move to a contactless card system to take benefit of discounted rates. Senior citizens, students and the disabled further get 50% off that rate through specialized contactless cards. It’s really simple to use because everything is automated. When you go through the gate, you tag in. No money is deducted at this point. When you arrive at your destination, you tag out. This is where the money is deducted and the fares are automatically drawed down from your card’s balance based on how far you travel. With this model the Taiwan Metro system makes profit every year. Because of this, we don’t even need fare increases. You right, most of the LACTC are gone but have been replaced by many employees with no transit experience. I am a former Transit Supervisor retired from the MTA. Let me give you an example of the current employees hired off the street. I was told during the construction of the Hollywood/Vine Red Line joint development,the “W” Hotel, that if I had not moved the buses from a layover zone adjacent to the construction the DWP: would have dug their hole somewhere else. At a Westside/ Central sector meeting the head of scheduling made the statement there would be no service delay if no buses pulled out of the yard. That remark was met with disbelief among all the managers including myself. This statement again was made from someone hired off the street. Rail from the start has been ran by former LACTC executives with few exceptions. I started working at the agency and became a supervisor under the RTD. I saw the change in leadership and overall operation that has resulted in the downfall of the operation. No gates at the rail stations was a LACTC idea. Remember the Blue Line was a LACTC operation using RTD personal. When TAP Cards were introduced the idea initially was to have the Bus Operators sell them on buses. The ideal amount was 20 cards to be issued to each operator everyday with the extra’s handed back in. At the managers meeting the person, again off the street, was laughed at. I pointed out Bus Operators sell more than 20 Day Passes on one trip. When I still drove a bus back in the 1980’s I sold more than 40 transfers per trip. The MTA is working with it’s second group of electronic farebox’s. Most other agency’s allow their supervisors to reset them/repair them on the street. The MTA will not allow it. They would rather loose the revenue. Lastly, when the Blue Line first was in operation the ticket machines were not on line. They were trying to figure out how to collect the fares. I offered a suggestion to use old mechanical fareboxes which had been taken off the buses manned by operators. My suggestion was accepted . The latest radio system was being installed and a computer tech told me they had come up with a so called fail safe solution of bus operators no signing on to the system prior to pulling out of the yard. This was important especially in a emergency to track the exact location of the bus. The solution was the bus could not be started up until the sign on was completed. I pointed out if this was the case every bus would come to a stop if the computer system crashed. The next day I was told the solution had been scrapped because they never thought about the consequence. I agree with you, changes need to be made. But as long as those in control disregard what those with knowledge have and relied on those from outside the agency’s nothing will change. One last note. For several years former LACTC employees refused to move into the brand new MTA office building. There was ample room and how they got away with it is unknown to me but it happened. The bottom line was they did not want to work side by side with former RTD employees. Can we stop comparing Los Angeles Metro to Singapore? In Singapore the government can simply impose fare changes on the public. It is a unitary state. In America we have robust public comment, political dynamics of the Metro Board (4 members from City of LA, 5 County supervisors, 4 members from non-LA cities), Federal scrutiny (Title VI, which prevents fare changes from having disparate impacts to low incomes and requires changes to be comparable between racial groups), a much more diverse environment (eight Title VI elibigle languages), and a more complex operating environment (including Metro operators and contract operators). It just doesn’t work like that. Maybe if you are starting from scratch. But everyone who would lose from a distance based fare system – people making longer trips, or indirect trips (since the bus route that they may want to use does not operate at the times they need to travel, they may go an indirect route which is more distance) – will vigorously complain. As they should. It’s a free country, unlike many of the Asian ones. And politicians will listen if they want to be reelected. This is why distance based fares are a total non-starter. Not necessarily for technical reasons (although they are prevalent) but for political reasons. What you describe is a Tap In/Tap Out system. The MTA is just starting a Tap In system on trains. And on buses that would mean two or more TAP out. With the problems I have observed with passengers Tapping in , Taping out would be a nightmare. It may well work in Taiwan , those passengers are smarter, but not here. Since I’m unfamiliar with the transit systems in Taiwan I can’t tell you how they operate in a less expensive way. You are aware the MTA is not just in the public transit business. They build bikeway, freeways, beautification projects, etc. all none public transit related. This is Los Angeles, not Asia. Tap Cards and Day Pass’s have been a nightmare at the MTA. In addition both have caused the riding public to pay more to get from one point to another. While Day Pass’s offered unlimited travel each day Tap Cards charge the rider a full fare each bus they board. Fare Zones were all but abolished prior to 1980 except on selected lines that cross into another county for instance like the 460 going to Disneyland. Now some are advocating fare zones again using technology like that used in Asia. To my knowledge no transit agency in the U.S. has adopted the Asian business plan, why? If the MTA adopted such plan how long do you think it would take to purchase the equipment and install it on about 3000 buses and trains. And in the end how long would it take to recover the cost of the upgrade? Remember the fare hikes are needed to the current service. I take offense to this. Taiwan is a very free country with a democratic process and is pro-capitalist. It is a major trading partner of the US. It has a very highly advanced economy and is one the fastest growing economies in the world. The Taiwanese people elect representatives to government. There are political parties in Taiwan. So are many countries in Asia. Is South Korea not a democracy and a capitalist country? Is Japan not a democracy? Japan is an Asian country that is in the G7, the seven most advanced economies in the world. Perhaps you need to learn more about Asia than thinking that Asia is all about totalitarian single-party Communist dictatorships like mainland China or North Korea. In many ways, California sounds more restrictive than Asian countries. There’s so many stupid restrictions to get anything done here. Just look at how long it’s taking to build the subway to Santa Monica. I’ve been hearing that ever since I was in elementary school. I’m in my thirties now. When’s it going to get done? When I’m in my eighties? $100 x 3000 buses, $300,000, about a years’ worth of salary for Metro CEO Art Leahy. So for $300,000, Metro can easily move to distance based fares for all their buses. Anything other BS excuses that I can debunk easily with a Google search? I think everyone should have a time out. Let’s analyze the facts here. Has anyone considered that distance based fares might actually be the secret to Asian transit agencies’ success of recovering over 100% farebox recovery ratio? The data all seems to be there. All Asian transit agencies make over 100% farebox recovery ratios. None of the US transit agencies can achieve that. All Asian transit agencies use a low priced distance based fare model. None of the US transit agencies utilize a low priced distance based fare model. Yes, Asian transit agencies have high ridership numbers, but it posts a 100%+ farebox recovery ratio. But NYMTA, MBTA, and SF MUNI all have high ridership numbers, but despite that, it fails to make a 100%+ farebox recovery ratio. Asian transit agencies being property developers have nothing to do with it. Farebox recovery ratio means fares collected from the farebox alone, real estate revenues are separate. Does that mean the secret to achieving farebox recovery ratio is a distance based model one that starts off very low, and goes up farther you go? Nice video. Looks like service in the San Gabrial Valley but not in central Los Angeles where more than one or two passengers board a bus and alight at the same time. Buses are hard enough to keep on time, now your advocating passengers alight single file in a orderly fashion. Only in your most vivid dreams is that going to happen here or anywhere else in the United States. And $100 for each additional Tap Out monitor, are you kidding. It would be about three or four times that amount just for installation if they were lucky. YES! That’s what I’ve been trying to say! Just look at how big oil companies make billions each year. Despite all the money invested by oil companies in oil exploration, digging, refining, and transporting them to the neighborhood gas station, they sell gas at a cheap price. An average car today gets 30 MPG. That means a car can go 30 miles with a gallon of gas. The price of gas today is about $4.00 a gallon. Therefore, the price to go 30 miles is $4.00. The price of gas to go one mile therefore is $4.00/30 miles = approx 13.3 cents a mile. And this is the business model of big oil companies. They are literally selling people a method of transportation for 13.3 cents a mile. An average car holds 10 gallons of gas. A car that holds 10 gallons of gas therefore can therefore go 300 miles before it needs a refueling again. When the gas hits empty, you fill it up again at a rate of $4.00/gal into a 10 gallon tank, or about $40 every refill, every 300 miles, at a distance rate of 13.3 cents a mile. And that is how big oil makes billions each year. Even if gas prices go up to $10 a gallon, for a car that can get 30 miles, it’s still going to be 33 cents a mile. Or if in the unlikely event that gas goes up to $10 a gallon, one can swap out a car for a 100 MPG scooter. Now it’s more cheaper per mile despite the increase in gas prices because now you can go 100 miles on one gallon of gas. $10 gas / 100 miles = 10 cents a mile. How can Metro ever compete or make car drivers switch to transit when big oil operates a “fare system” of 13.3 cents a mile today? Yes, I’m sure there’s going to be people who are going to say oh you forgot the cost of insurance or cost of repairs, but we’re talking about how big oil makes money. Not insurance companies or auto repair shops making money. What is the business model oil companies use to make billions each year? They do it by selling gas at $4.00 a gallon, which in the end is literally selling transit for $0.13 cents per mile. Compare that with Asia. Starts off low as $0.80 and gradually goes up to $2.00 or so? Now that’s more in line with the business model of big oil companies making money. And remember, big oil companies also have their own expenditures too. Oil just doesn’t magically pop out of thin air. There are costs to finding where the fossil fuels are, drilling and pumping them out, refining costs, and transportation costs to the local gas station. And even then, big oil manages to churn billions in profit per year, at a rate of selling car drivers oil at 13.3 cents a mile (for a car that gets an average of 30 MPG at a gas price of $4.00/gal). Well guess what, I have another one for you: this is LA, not New York or San Francisco. We’re a lot bigger than NYC or San Francisco. A flat rate fare system will not work here in LA County which is what Metro serves. You cannot cover all of the Los Angeles COUNTY Metropolitan Transit Authority cannot cover everywhere from Malibu to Ontario, from Lancaster to San Pedro under a single flat rate fare structure. You can’t set the same price for someone going all the way from Long Beach to DTLA to someone who only wants to go to their neighborhood supermarket. LA County is too big to be on a single flat rate fare structure. If technology is at hand is capable of doing distance based fares efficiently, why aren’t we using it? We spent millions on TAP, use it! Unless there is a solution at hand, all we’re keep doing is raising our fares over and over again. Raising fares over and over again is not a solution, that’s just raising prices without a fix to the problem at hand. And it’s a costly measure in itself. Everytime there’s a fare increase, you’d have to do more meetings, more hearings, and deal with more angry citizens. How is that not costly to taxpayers? Did you think of that? Singapore manages to do exactly what you said despite it’s a lot more crowded and a lot more denser city than Los Angeles. Singapore is just as ethnically diverse as Los Angeles with many mixes of minority groups and spoken foreign languages – four official languages to be exact in Singapore: English, Chinese Mandarin, Malay, and Tamil. Anyone who has been to Singapore can tell you this straight off the bat. Sir, may I say it bluntly, that despite your “years of transit experience,” how can you call yourself a “transit expert” if you never ONCE tried out Asian mass transit? A true “transit expert” would be able to try out, compare and contrast many different types of transit systems from all over the world, from US to Europe to Asia and make their best judgment based on those experiences. I don’t know how old you are, but in all your years of public transit service, have you not ever, at least once, went to places like Japan, Korea, Taiwan, Hong Kong or Singapore? I find it absurd that you never once visited cities where it ranks constantly high up above as cities with the most excellent, on time mass, successful, and profitable transit systems in the world? When it comes to mass transit, why is it that you only look to US and Europe, but never Asia? May I ask why? Because common sense, at least to me, thinks that if I were to be working at a public transit agency for many years and if the news reports and transit blogs constantly say New York, London, Tokyo, Hong Kong, and Singapore have the best transit systems in the world, wouldn’t I want to visit these cities for myself and try them out first hand? Or were you somehow fine just by going to New York and London and call yourself a “transit expert” disregarding Tokyo, Hong Kong, and Singapore, all Asian cities, for whatever reason? Was it based on a biased judgment that they were just “too different” from “white countries?” Is that, the underlying decision? People working for Metro should also look at Seoul. Had they just copied every thing that the Seoul Metro does with their T-Money Card system, they would’ve gotten TAP right from the start instead of this mess we have today. Look at the TAP webpage for example. Didn’t anyone do a beta test to see how god awful the web system is? It’s like you need an instruction manual on how to use it. When they implemented TAP, all they had to do was do exact same thing that Korea does with T-Money Card. Or all the other similar tap-in and tap-out contactless payment systems all across Asia. They all run the same way and they’ve figured it out long time ago how to do it. For example, they could’ve asked around local businesses to see if they would be willing to start accepting TAP to buy goods so people use it like a regional debit card system. You tell businesses in LA that compared to accepting payments with a credit card, which normally charges 3% to businesses, that the TAP card will only charge them 1%. And that 1% in transaction fees everytime businesses accept payments with a TAP card could’ve gone into additional revenue for you guys. See, why couldn’t you think of that? So many money making opportunities but you guys never go after them. All you know how to do is ask for more taxes from the people. Make your own money first, stop asking the people to give welfare to you. Don’t people working at Metro have Asian-Americans working there? I’m sure there’s one there because a girl named Anna Chen who posts articles from time to time. Can’t you just ask her for how it’s done in her native country? So simple! Just ask her how it’s done where ever she’s from and do exactly what she tells you to do! Los Angeles is so diverse with so many ethnicities, why can’t they just hire or ask all the Koreans, Japanese, and Chinese living here on advice how Asian cities are able to run transit so well, on time, keep them so clean, and even make a profit out of them? Doesn’t it make sense that if you want an excellent transit system, you should be learning from the masters? The Asians are the masters of transit systems, and you have so many living here in LA. Just ask them! It’s that easy! Any Asian would’ve told you that the honor system was a stupid idea with so many flaws. All you had to do was ask. And look where we are now, scrambling and spending so much money to fix it when it could’ve been done right from the start. Why does Metro have to keep screwing everything up all time? Can’t you guys think?You talk about ethnic diversity, yet they don’t even learn from the cities that have the best mass transits in the world. Can’t you guys like, fire everyone working at Metro and hire Asians instead? Koreans, Japanese, Taiwanese, Hong Kongers, Singaporeans, they all live here in LA and they’ll all tell you how it’s done. And they’ll fix everything all at once for a way cheaper price we pay with our taxes to the novices working at Metro. I have no desire nor ever had to travel to Asia for any reason. I have transit operation experience. Just riding the bus or light rail trains certainly does not qualify you as a expert in any way. What works one region may not work in others. These simple examples as to how a Tap like card works in Asia so it must work here is only a fantasy. With all your so called transit experience have you ever dispatched 300 buses and filed open assignments from a transit division in a two and a half hour time period? Have you ever assisted in the upgrading of a radio system, exchanging one radio system with a new one, for 300 buses in a two week period? Have you ever detoured a multitude of bus line in a emergency? Have you ever investigated a traffic accident or crime on a bus that resulted in a fatality? Have you evacuated thousands of people due to a disaster like a earthquake or forest fire. And lastly, have you ever been called upon by the Secret Service to assist when the President is in town or shuttle passenger during a former Presidents funeral? You see Tap Cards involves so little when you look at the big picture. I could go on and on but that would just confuse you more. You see, I grew up in Los Angeles and am somewhat of a expert on how the transit system evolved from a privately owned system to the agency we see today. Abolishing the fare zones was part of the deal when they raised the fare at one time. I don’t know which lines you ride but ones like the 20 and 720 lines passengers are pushing their way in and out. No time to Tap Out in a orderly manner. Believe it or not but when I drove a bus we had mechanical fare boxes and we had to count the money deposited rapidly then clear the inspection plate for the next passenger to pay.plus issue transfers Bus Passes were flashed in our faces and we had to be able to identify if the pass was valid or not. Electronic fare boxes and Tap Cards have slowed down the process instead of speeding it up. Bus Operators today have a hard enough time just doing their job and attempting to stay on time. What your advocating would only hamper service not improve it. Now if no Tap On / Tap Off could be achieved without a physical scan then it would be acceptable but not a Tap Off where the passenger always in a hurry would have to scan their card and make sure they were not being overcharged. Can you imagine the turmoil each month when multitude of passengers complaining they were overcharged. Like I said before, it’s a different culture from that in Asia. Many people in Los Angeles are rude and act in a cut throat mentality when on the bus and trains. So after all the arguments that we’ve made, after all the myths that I’ve debunked, it comes down to that – people of LA can’t be trusted. Yeah right. I can discredit this easily. Let me say this then. When TAP was introduced, it was supposed to be a foundation for a regional fare system, one that includes Metrolink. Metrolink runs on distance based fares. If TAP were to be used to include Metrolink, as was the original plan intended to be, HOW DID YOU GUYS PLAN TO INCORPORATE METROLINK’S DISTANCE BASED FARE STRUCTURE WITHOUT A TAP-IN/TAP-OUT SYSTEM. Don’t give me that BS that people of LA can’t be trusted to do tap-in/tap-out because of our mentality. The people of LA also ride on Metrolink. And if Metrolink were to go to TAP, and sooner or later it will have to, how do you plan to do it without a TAP-in/TAP-out structure? Good point by the poster above. You can’t do distance based fares without TAP-in and TAP-out. Metrolink runs on a distance based fare scheme, just like BART and Caltrain, which also uses a TAP-in/TAP-out system on ClipperCards. 2. TAP should have to accommodate a TAP-in/TAP-out feature in consideration that Metrolink uses distance based fares. I doubt Metrolink will ditch their distance based fare model in which it’ll cost the same to go from Union Station to Oceanside as opposed to Union Station to Glendale, so that really only leaves us with option 2. So, being said that, TAP will have to eventually do TAP-in/TAP-out and Angelenos will have to learn that process whether or not mike dunn himself personally thinks that “many people in Los Angeles are rude and act in a cut throat mentality when on the bus and trains” who can’t possibly do a simple thing as TAP-in on entry and TAP-out on exit. How can you compare Metro Link with bus operation? Metro Link makes scheduled stops for two or three minutes whereas bus are supposed to be out of a stop within a minute to stay on time. I have never observed Metro Link passengers pushing their way on and off trains.On most busy bus lines this is the norm. Passengers do not alight MTA buses in a single line , they push and shove to get out the door. Lastly what just came to mind, who’s going to guard these monitors from being vandalized? If your a constant rider on urban bus lines in L. A I’m sure your have seen graffiti on the seats and windows. And why do they have plastic seats, because vandals cut up cloth seats. So when the monitor doesn’t work are you advocating pulling the bus off the street? If so, look for one hour wait times because many the buses will be in the yard being repaired. This is not Asia, it’s Los Angeles with a overall different culture that in some cases take great pride in their mission to destroy anything nice. Hell, people here push their way out of airplanes and you expect a single orderly line to alight a bus at a major stop. Give me a break, it’s a great idea but I doubt if it work using present technology in our urban environment. Don’t try to pull off a “this is LA, not (wherever]” when all else fails when you cannot come up with a concrete answer, all the while using the exact same argument that “(wherever) does free transfers so LA should too” only when it benefits you. I agree. Metrolink has to move to TAP and when it does TAP has to have a TAP-in and TAP-out structure to fit with Metrolink’s fare system. I think we can all start to lay the rest that “TAP-in and TAP-out can’t be done here in LA” once Metrolink goes onboard with TAP. With that, I don’t mean the stupid paper TAP cards we use today to transfer to Metro. I want the ability to just fill up my TAP card with money, and tap-in and tap-out as I ride Metrolink, fully with a fare cap system so that I don’t have to worry about passes, and use the same TAP card to get on Metro when I make a transfer at Union Station. I want my TAP card to be used as my sole pass that I need to carry whereever I go. On Metrolink, on Metro, on Torrance Transit, you name it, it works with one blue plastic card. Once Metrolink moves to a TAP-in/TAP-out structure as it’s the only way it can be done, then we can discuss whether the same technology and a distance rated fare system can be applied to Metro Rail, BRT lines, Metro Buses and all other municipal agencies.